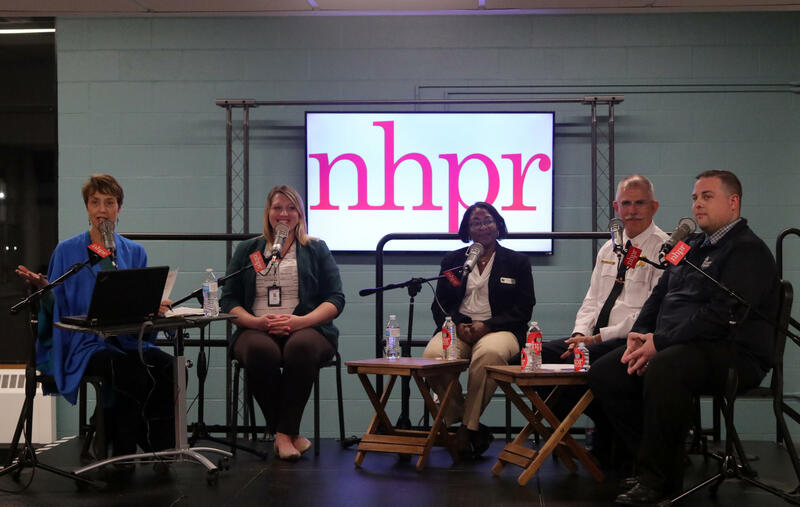 This discussion was recorded at the Nashua Public Library on February 7th, and an edited version of the conversation originally aired on Thursday, February 14th. The conversation is also available below. Click here to find the full, unedited discussion. Bobbie Bagley - Director of Nashua’s Division of Public Health & Community Services. Melbourne Moran - Director of Integrated Care and Population Health at Harbor Homes Inc. Moran oversees the Mobile Crisis Response Team, Safe Station, the transitional housing program, and outpatient behavioral health services. He is also a licensed clinical social worker focusing on trauma-informed care and workforce development in healthcare. Jessica Parnell - Recovery coach at Revive Recovery Center in Nashua. Parnell is the city’s first publicly-funded recovery coach. Brian D. Rhodes - Chief, Nashua Fire Rescue. According to the National Institute on Drug Abuse, New Hampshire has the second highest-rate of opioid-related overdose deaths in the country. The city of Nashua offers a unique perspective on the opioid epidemic for the various approaches the community is taking to tackle the issue. In the fall of 2018, Nashua was named one of nine regional ‘recovery hubs’ throughout the state where services are specially targeted to reach sufferers and aid in recovery. Nashua is a ‘Safe Station’ city. Through this designation, opioid addicts can freely walk into any city fire station – free of reprisal – to be connected with essential recovery services. The Mayor’s Opioid Task Force (MOTF) brings together a group of community leaders and concerned citizens, using a community-wide, ‘collective impact’ model to tackle various dimensions of this public health issue. As a border city, Nashua neighbors the Merrimack Valley region of Massachusetts, where many communities have been hit hard by the opioid epidemic, shaping a cross-border perspective on different approaches. We sit down with Department of Health and Human Services Commissioner Jeffrey Meyers. The Department of Health and Human Services is the largest state agency and accounts for approximately forty percent of the state budget. We discuss the state's ten-year mental health plan, as well as recent challenges to medicaid work requirements. And we get an update on the state's hub and spoke system for addiction treatment, and concerns about the Division of Children, Youth and Families. Listen to our conversation with Commissioner Jeffrey Meyers. Jeffrey Meyers - Appointed in 2016, Meyers is Commissioner of the N.H. Department of Health and Human Services.